We all know that New England Patriots fans are avid about having the latest and best shirts, hats, videos etc.that have to do about the team, the Super Bowl wins and the on-going dynasty for the past two decades. And if you’re looking for a gift for that person who has just about everything Patriots-related then this book is just for you. 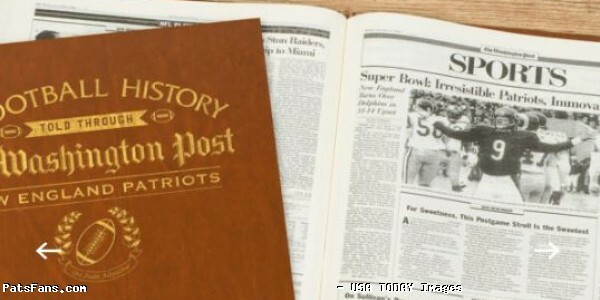 A company called “In-the-Book” has compiled a history of the Patriots told thru articles in the Washington Post. It is a very nicely done, hardbound cover history of the team. 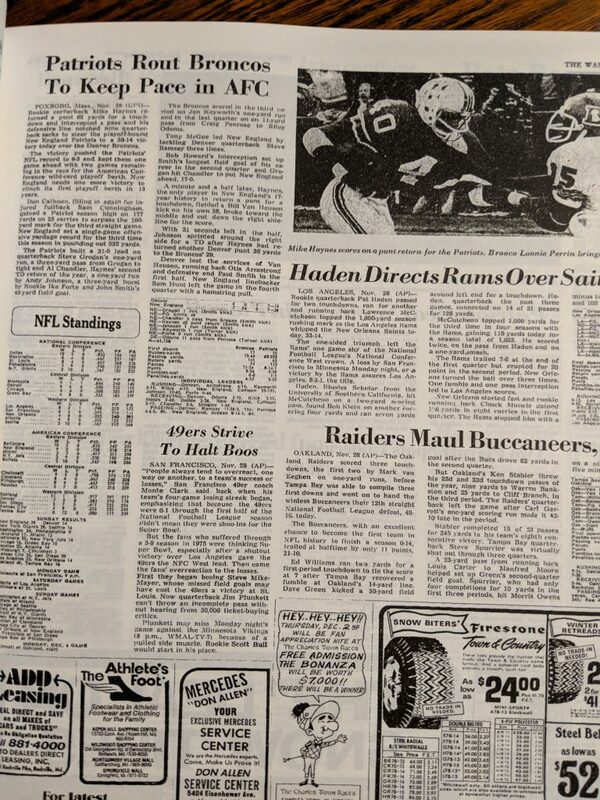 Some of the earlier articles, taken from the Post’s archives don’t have the clarity of the more recent pieces but reading a story about the 1960 team where Butch Songin led the Pats to a 38-21 victory over the New York Titans right next to ads that are selling brand new snow tires for $12.77 a piece or a car lot selling brand new imports for $1500 is interesting to see how things truly have changed. There are articles, pictures, and box scores from many of the games that… if you were even around back then, you’d long forgotten about but then a glance at the piece or box score will bring back a flood of memories. Some good, some not-so-good. But that represents a true history of this franchise. The company had reached out to us and sent us a copy for our review, and will even publish a dedication inside to someone. For our purposes, I figured that it would be best served by giving it to a young fan who would appreciate the history and have something to keep and use for reference. So, I dedicated our copy to Brady Goldman, our colleague Russ’ son. He’s gotten big into the team the past few years as he’s grown up and now can’t get enough. This would be a perfect gift for those like him or that older fan who has everything and will present a good look at the days of yore. 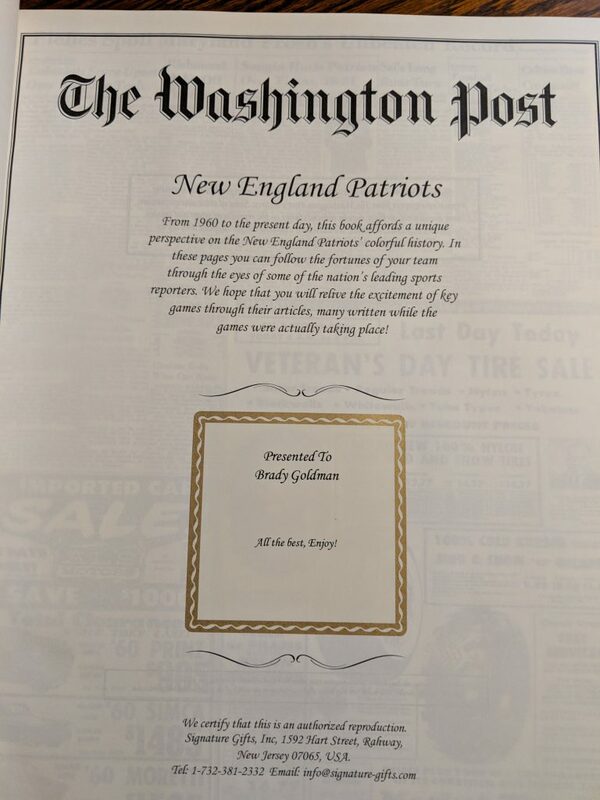 The company has excellent customer service personnel who will be very helpful if you have any questions and is a great keepsake for the Patriots fan who would like a beautifully done book that can be passed on to the next generation of fans. 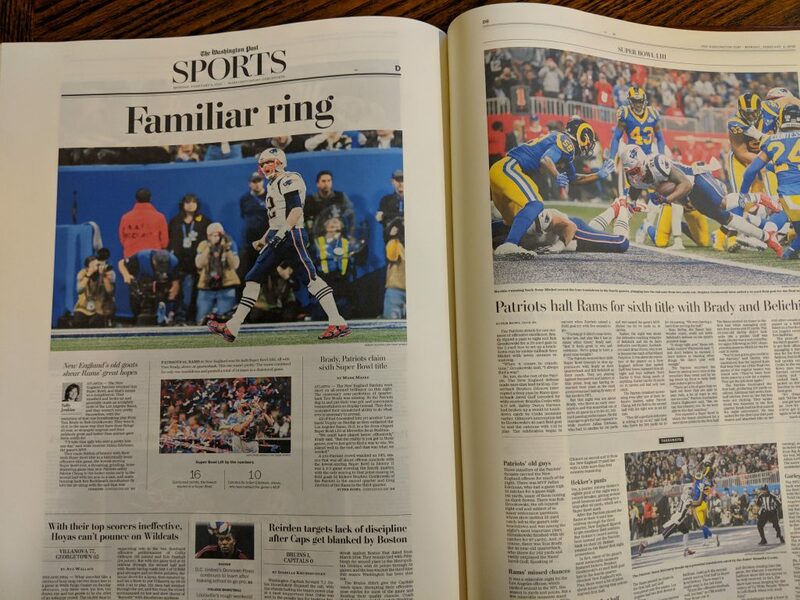 This entry was posted in 2019 Patriots offseason, Patriots Commentary, Patriots News, Super Bowl LIII and tagged Bill Belichick, Bill Parcells, Billy Sullivan, Boston Patriots, Chuck Fairbanks, New England Patriots, New England Patriots History, Patriots Super Bowl wins, Personalized book, Tom Brady, Washington Post on April 19, 2019 by Steve Balestrieri. New England Patriots wide receiver Julian Edelman’s 2018 season was a story of redemption. After missing the entirety of 2017 recovering from an ACL tear, Edelman was suspended the first four games of 2018 after testing positive for a performance enhancing substance. In 12 games, Edelman finished 2018 with 74 receptions for 850 yards and six touchdowns, but he was even better in the postseason. 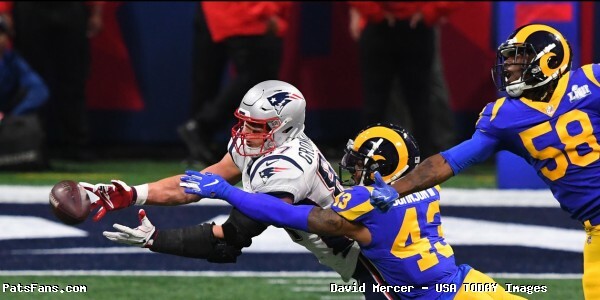 Edelman hauled in 26 receptions for 388 yards during the Patriots run to Super Bowl LIII. 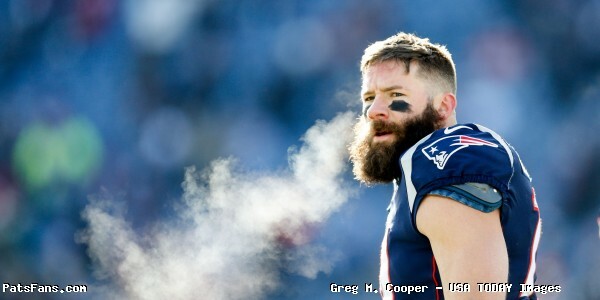 The numbers moved Edelman into second-place all-time in playoff receptions and receiving yards behind Hall of Famer Jerry Rice. Edelman caught 10 passes for 141 yards on his way to being named MVP of Super Bowl LIII. 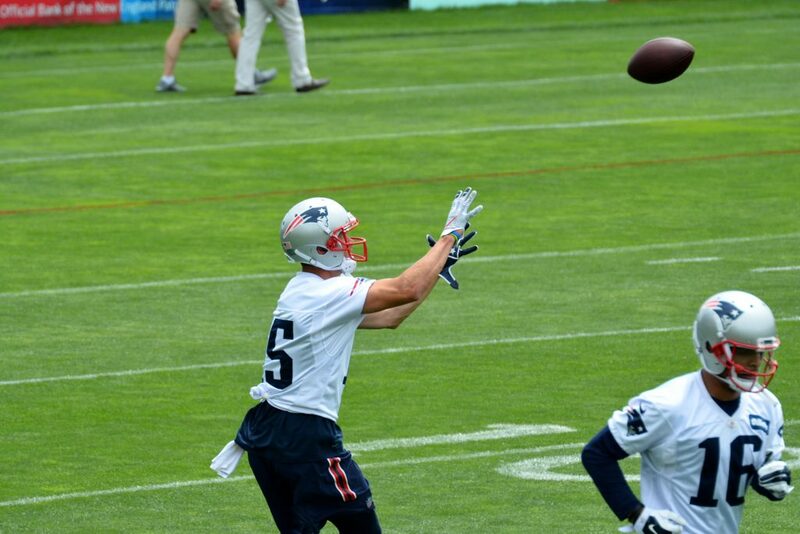 On Instagram Wednesday, Edelman shared more motivation for improvement. “You have to want it more…#Relentless”, He wrote in a caption. 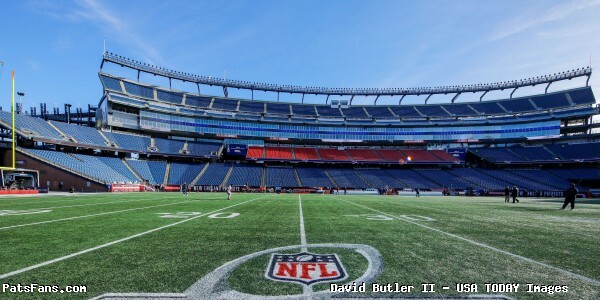 This entry was posted in Patriots Photos, Super Bowl LIII and tagged Julian Edelman, Super Bowl LIII on April 17, 2019 by Robert Alvarez. The City of Boston saw a “double dip” in championship celebrations on Tuesday. At Fenway Park, the Boston Red Sox raised their 2018 World Series championship flag and gave out their rings in a special pregame ceremony that also included the Super Bowl champion New England Patriots. The Patriots and Red Sox have combined for 10 of Boston’s 12 professional sports championships in the “Big Four” leagues since 2001. After winning the World Series last fall, the Red Sox went to Gillette Stadium on duck boats before the Patriots game against the Green Bay Packers. Check out all the best sights and sounds from the festivities below, including the first pitches thrown by Julian Edelman, Rob Gronkowski and Stephon Gilmore. Just a couple of legends on Opening Day. This entry was posted in Patriots Commentary, Patriots Twitter, Patriots Video, Super Bowl LIII and tagged Julian Edelman, Rob Gronkowski, Stephon Gilmore on April 10, 2019 by Robert Alvarez. 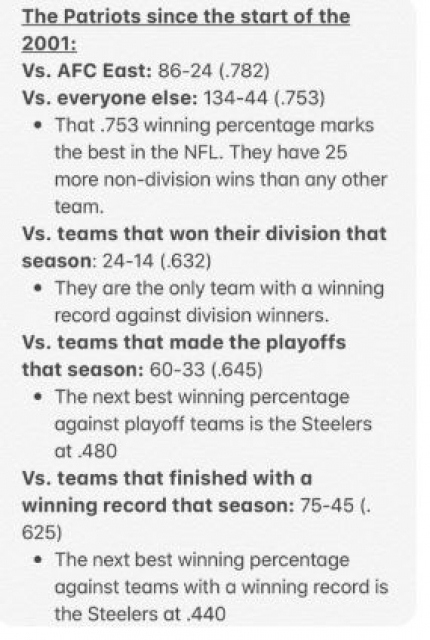 The New England Patriots shared a little housekeeping on Twitter this week. On Thursday the Gillette Stadium front office sign had work done to include their Super Bowl LIII championship alongside the previous five. 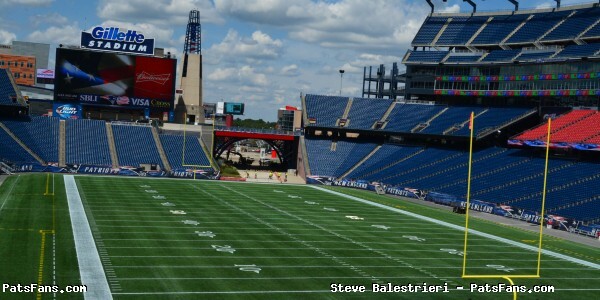 This entry was posted in Patriots Twitter, Patriots Video, Super Bowl LIII and tagged Gillette Stadium, Super Bowl LIII on March 29, 2019 by Robert Alvarez. The offseason workouts for the 2019 season have officially begun for Super Bowl LIII MVP Julian Edelman. On social media this week, Edelman was spotted training in Miami with friend, former teammate, and police partner Danny Amendola. 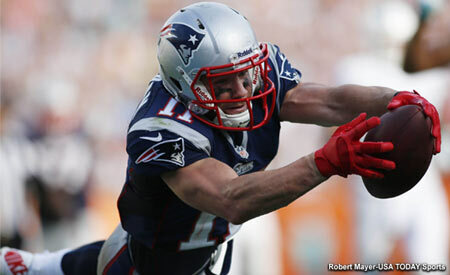 The receiver duo were teammates on the Patriots from 2013-2017, Amendola recently signed a one-year, $4.5 million contract with the Detroit Lions. He spent his 2018 season with the Miami Dolphins. The Patriots showed interest in a reunion with Amendola before Free Agency opened, but he ultimately choice to join up with Matt Patrica’s squad in Motown. 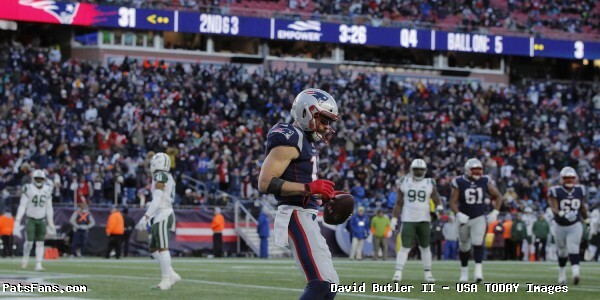 This entry was posted in 2019 Patriots Offseason, 2019 Patriots offseason, Patriots News, Patriots Video, Super Bowl LIII and tagged Danny Amendola, Julian Edelman on March 20, 2019 by Robert Alvarez. Offensive tackle Trent Brown wasn’t a New England Patriot for long, but his impact won’t be forgotten with the 2018 Super Bowl champions. On Thursday, the newly signed Oakland Raider shared a goodbye video message to the Patriots and fans via Uninterrupted. On the first day of free agency, Brown signed a four-year contract worth $66 million dollars with $36.75 million guaranteed. The contract made him the highest-paid offensive lineman in NFL history. At his introductory press conference in Oakland, Brown spoke about the significance of his new contract. In his lone season in Foxboro, Brown started every game at left tackle right through the Super Bowl. 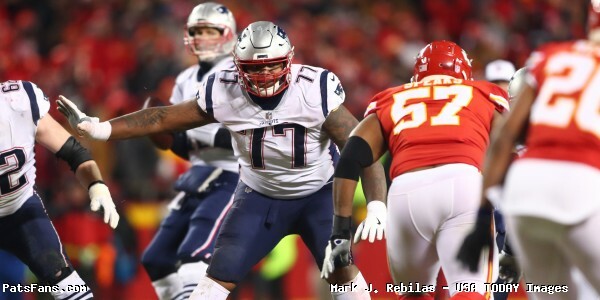 This entry was posted in 2019 Patriots offseason, Patriots News, Patriots Twitter, Patriots Video, Super Bowl LIII and tagged Trent Brown on March 15, 2019 by Robert Alvarez. Since his selection at 27th overall in the 2010 draft, safety Devin McCourty has become an influential leader of the Patriots defense. A defensive captain for eight consecutive seasons, McCourty has been apart of five trips to the Super Bowl during his Foxboro tenure. 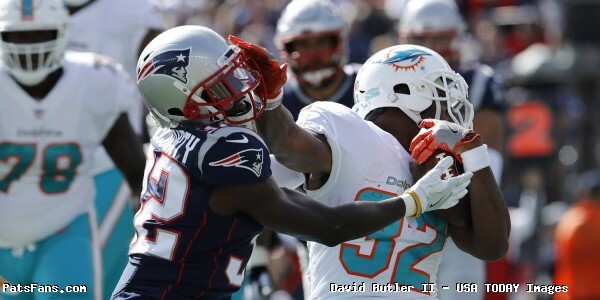 Before Super Bowl LIII, McCourty hinted at the possibility of retirement, but on February 21st acknowledged he plans to return in 2019. Over the years, McCourty’s voice with his teammates has also become an integral part of his success in New England. As part of their look back at the 2018 season, the Patriots shared video over Twitter containing the best McCourty pregame speeches. Check out how “DMac” fired up his defense all year long in the tweet below. Need some #MondayMotivation? D-Mac’s got you. This entry was posted in 2019 Patriots Offseason, Patriots Twitter, Patriots Video, Super Bowl LIII and tagged Devin McCourty on March 12, 2019 by Robert Alvarez.